Here is an introduction to the new members of our school community. Laura Heil was deep in the forest of Zambia, Africa, late at night, holding a flashlight. She was helping a research team to collar a cheetah. “I learned so much just sitting there and watching the team do their thing,” Laura says. Now Laura is looking on again, this time in a classroom, as an intern with Alison Gauthier in the science department. 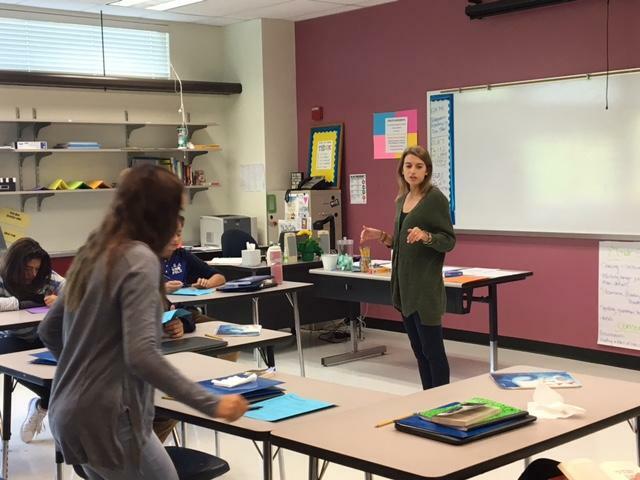 Laura’s first glimpse into teaching was as a Spanish tutor in high school in Hudson Falls, New York. Laura recalls a time teaching in Maine when she worked closely with a troubled student. “The first time I met him he was incredible, super curious, into the content, asking tons of questions, and very well behaved,” Laura says. Class was over, school was out, and Drew was the only life left in the math wing. He was determined; focused on preparing his room, moving posters, and transferring supplies to and from the office next door. Drew is a new math teacher at U-32. His preference in math is algebra but he has adapted to what the school needs: geometry. He looks very young, fresh-faced, eager — not much different from those he teaches. He now knows what he wants out of his career and who he wants to help. Drew started work at summer camps when he was sixteen, where he first discovered his passion for working with kids. 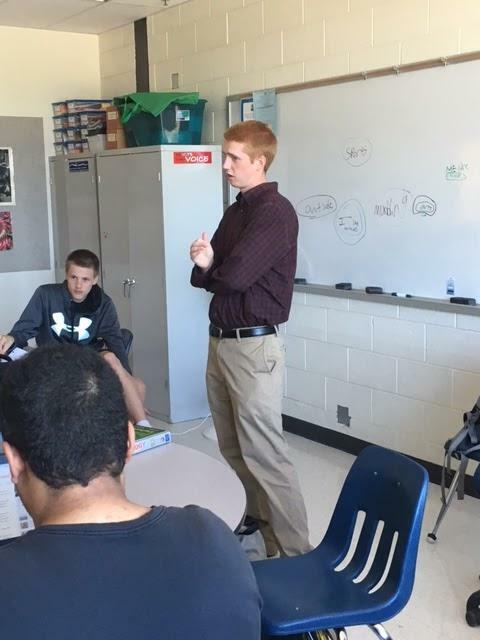 He student taught at Vergennes Union High School before getting his first actual teaching job here. “I want to help the kids that have had and still struggle with the tough experiences from their childhood,” Drew says. It’s 9:00, band one in Porthos Core. A group of five 7th graders are over by the window passing around an empty package of gum, smelling it. Abbey takes the package and persuades them back to their seats. Teaching “…kinda runs in my family,” Abbey says. This is her first official teaching job, after student teaching in Williston. She talks about how stressful it has been to get started as a teacher. “I’m starting from scratch.” She’s created all of her own materials for the class, and says that when she’s with the students it reminds her why she’s there. Abbey feels she needs to be stricter with the 8th graders. “The seventh graders don’t know any better,” she says. The 8th grade students know she’s new, but that isn’t holding her back. Brennan Lynch sits at her desk beside Kate McCann; papers scattered and laptop open. Her desk might look unorganized, but she know’s exactly what she wants from her intern experience at U-32. 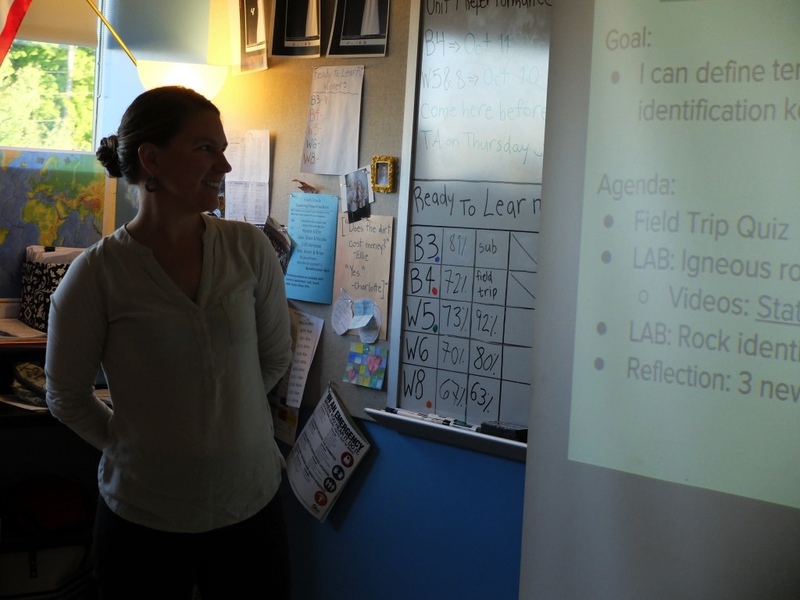 Brennan’s first glimpse into teaching was when she started working with the Dream Program at UVM. The program pairs up low income teens with college students. 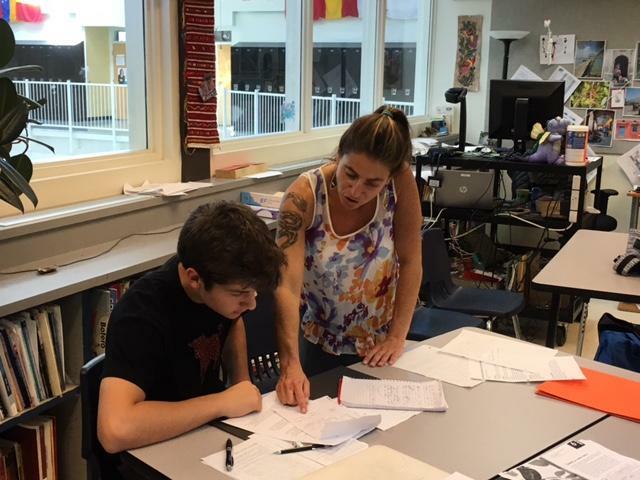 “Through working with my mentee and all his neighbors and family for those fours years, I kind of realized I wanted to be teaching,” she says. Kate has been a huge help in showing Brennan the ropes. Sarah Richardson got her first taste in education back when she did an environmental education program for her last semester in college. She got an internship at a residential treatment center and worked with kids who would then go to the Institute, a farm with plants and animals. Lots of the kids there “…had really unfortunate pasts…” and would act out and need to be restrained to calm down. Kids had to earn their right to leave the center to go to the Institute. 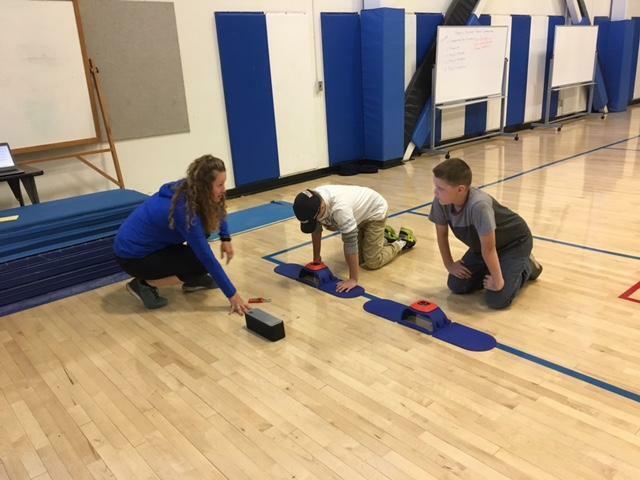 “…One student wanted to work on the farm so bad, and his behaviors were really challenging,” Sarah said. “It took him about three months to stop getting into the cycle of restraint.” Eventually he earned his right to go to the farm and changed once he began to work with animals. Sarah is an advocate for kids. She believes in proficiencies and it was one of the main reasons she was drawn to U-32 in the first place. Sarah is a special ed teacher here now. She also works in Blue Table for 11th and 12th grade students and works in the 10th grade Translation Academy. She understands how all students work differently and how transferable skills should be more than getting the right answer on a test. Erin left her family behind in Reading Pennsylvania to get her masters in biology, where she had amazing opportunities like genetically modifying zebrafish. These fish have a high quality sequenced genome which makes it easier to modify and “make them glow.” We share 70% of zebrafish genes, which are often used as models for humans in labs. Erin became a library volunteer at 13 and has taught anywhere from Sunday school to college courses, which she taught at night during the school year. Erin also was a long term sub at U-32 before this year. On my way to talk to her I was stopped by a friend who asked where I was going. 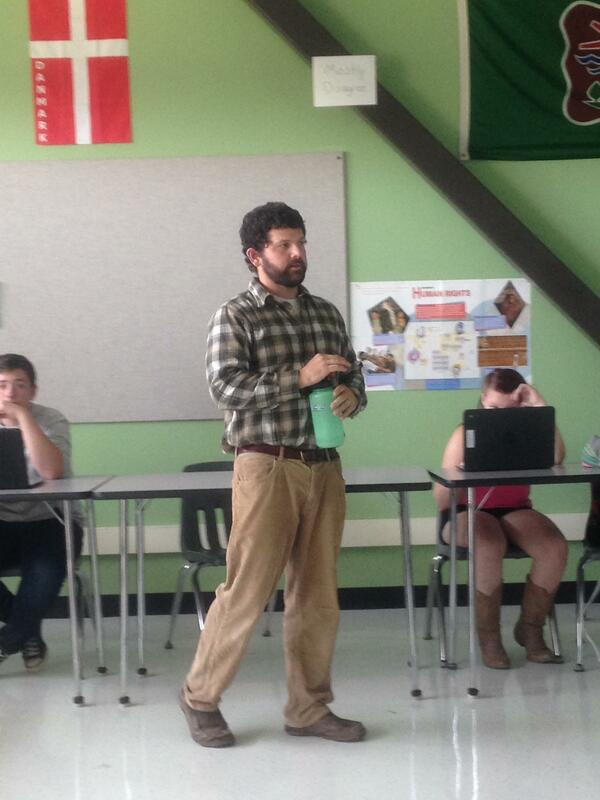 He’s the new middle school social studies teacher coming from Missisquoi Valley. Before he was a teacher he worked on an assembly line. He worked for a landscaping company in San Diego for a few years, and when he moved back to Vermont he had a hard time finding a job. He applied to the Teacher Education Program at UVM, which placed him at U-32 to student teach. Steve became the first head coach of their team. Afterwards, he received a letter from a former player. 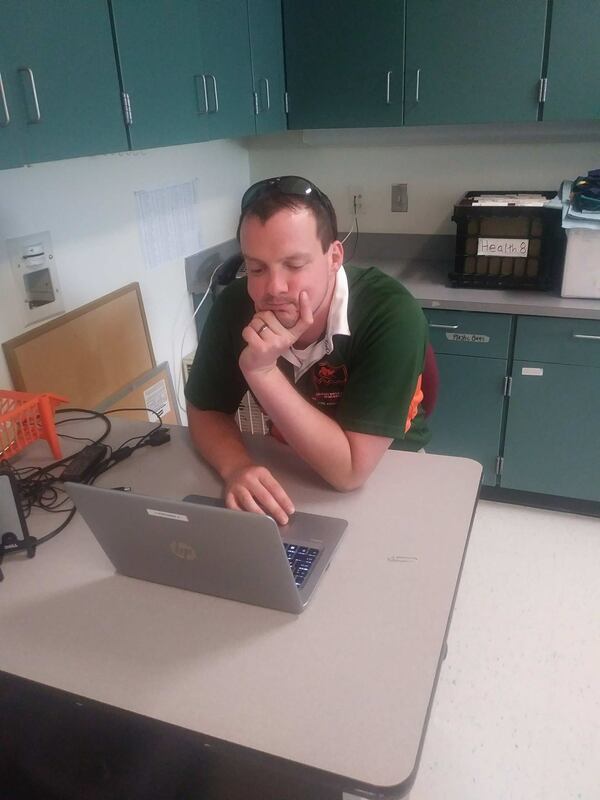 Our new physical education teacher is laid back in his chair, relaxed, focusing on his lessons for later in the day. Arsenault puts a lot of time into planning, and tries to adjust to his students. “If they aren’t grasping the lesson then I approach it a different way,” he says. It’s 2:45, shortly after the end of school. One of the new P.E. teachers, Molly Butts, sits in the gym office talking to her coworker Judy Abbiati. Cooper, a therapy dog, wags his tail as Judy offers a short walk, and Molly shifts her attention to her computer. Molly Butts grew up in Peru, New York, on a horse farm. She spent her free time riding horses. After high school, Molly attended Murray State University in Kentucky, where she got her undergraduate degree. She competed on the school’s rodeo team. Molly took her first teaching job in the Bronx, New York. After leaving that job, Molly took a position teaching P.E. in Germany at a German American school. During her time in Germany, Molly traveled to 40 different countries. “The last two years I was traveling almost every other weekend.” She learned to ski in the Alps. Finally, Molly got her job at U-32. “This has been a really big change of pace,” she says. It was calm in the high school for midday. The halls were barren, classrooms empty, teachers getting in their few minutes of quiet for the day. One such person was Debbie Koretz, a new Spanish teacher here at U-32. Debbie has been teaching Spanish for nearly 20 years, starting her journey in Stowe as a long term sub, before moving to Castleton. She stayed there for a year, before moving to Middlebury Union High School to spend thirteen years before moving out to California to a private school in Pebble Beach for the last four years. 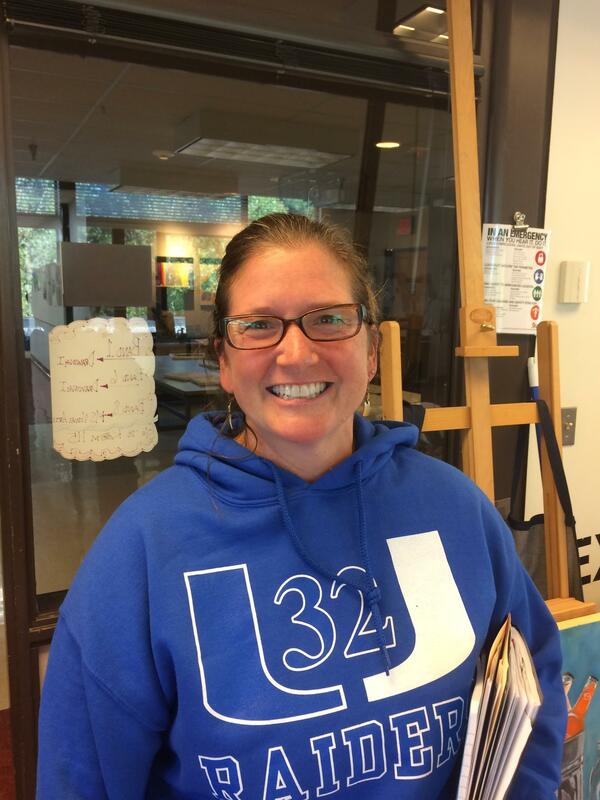 Pauline Cheeseman is one of the new teachers here at U-32, she teaches physics as well as middle school robotics. She is from Ohio and this is her fourth career, which she decided to pursue after she raised her two kids. Pauline is always looking for ways to improve her teaching. She learned organizational skills through a former co-worker. As I was looking for him there was another older man standing by the front doors who I’d never seen before, so I started talking to him. He wasn’t who I was looking for– he was a parent. But he just went along with what I was saying. I found Andrew soon after standing by the atrium stairs talking with one of the administrators. 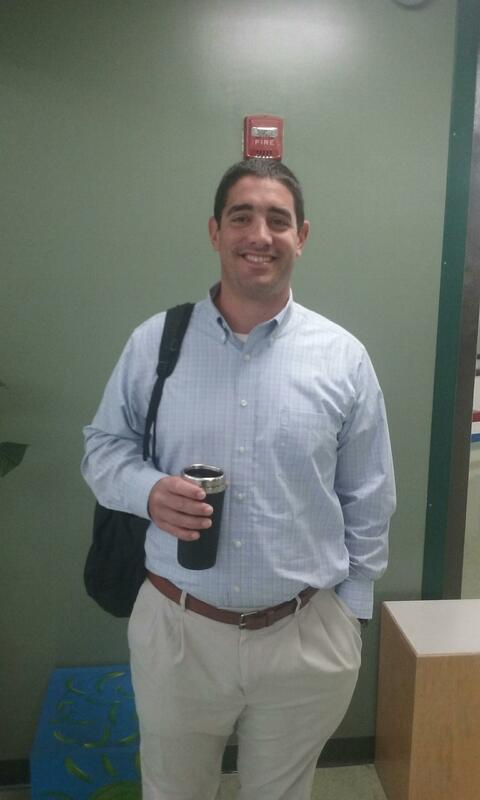 Conforti is a new football coach and special educator. Until this year, he lived in New Jersey, where he went to high school and college. He moved to Vermont this spring and soon after joined our community at U-32. “I was always into sports in high school,” he said. “I was a three sport athlete. I played football, basketball, and lacrosse”. “About two years ago I made the decision to move up to Vermont,” he said. He wanted to raise his children here and move closer to family. Alex Bell, a senior on the football team, had a good first impression of Conforti. “I love the therapeutic nature of this school.